Nauvari sari (9 yard sari), kamarpatta, and embellished jewelry; a necklace, hanging earrings, bangles, and ghungroos tied around slender feet. The movements of the dancing diva on stage create a perfect blend of the steps and the dholak, and the crowd gives a thunderous applause with whistles in the background. The Lavni performance was astounding but not many knew the dancer was Balaji Chikale from a small village of Atiwad near Belagavi. Balaji has been giving solo performances for over a decade now. 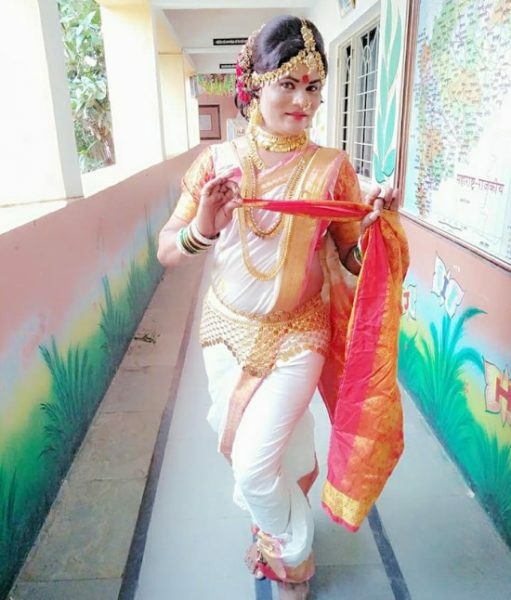 An ITI educated Balaji went to Mumbai in search of a job and while trying to sustain himself in the city of dreams he also lived his passion of dance and especially as a Lavni dancer. His performance at the Marathi Natya Sammelana recently received zealous acclaim. Lavani is a folk dance, traditionally performed by women for men. The popularity of Bin Baykancha Tamasha (or Performance Without Women) is very popular. Lavani as a dance form dates back to the seventeenth century, but came to prominence only during the Peshwa rule. A genre of folk dance, it deals with subjects like society, religion, and politics. Happily married Balaji has children and is an entrepreneur who deals with medical equipment. Balaji ventured into this field on impersonation as a woman for the love of the art form and passion for dance. So the next time you are watching a lavni performance, it could be our very own Balaji Chikale performing on stage.